Venezuela has a multitude of national parks that showcase the diverse ecosystems of the country. 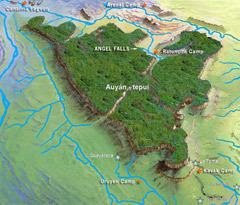 Venezuela’s national park system was established in the early 20th century. In 1935, the mountainous land along the northern coast was used to found Venezuela’s first national park. Originally Rancho Grande, the park has been known as the Parque Nacional Henri Pittier (named in honor of a Swiss biologist and ecosystem champion) since 1953. Today, Venezuela has 43 national parks. What follows are descriptions of some of the most famous and highly visited Venezuelan national parks. The Swiss biologist, Henri Pittier, was the first to protect the Venezuela’s ecosystems. Parque Nacional Henri Pittier has dramatic topography that is characterized by steep slopes covered with deciduous and tropical forest and cloud forest at higher elevations. The park’s flora is exuberant. Arboreal ferns, bromeliads, and several species of ornamental plant-notably the rare, endemic Gunnera pittierana-flourish. Animal life is equally diverse and the park is home to pumas, ocelots, otters, brocket deer, tapirs, kinkajous, coatis, tree porcupines, several species of snake and lizard and the marsupial frog. Canaima National Park – click to enlargeCanaima National Park is the sixth largest national park in the world. The park encompasses the Laguna Canaima, the Carrao river basin, the mountains of Sierra de Lema, the Gran Sabana and the Angel Falls. The landscape of the park is dramatic and contrasting. Massive geological and altitudinal variation has produced a huge range of habitats within which flourishes an exuberant diversity of flora. The park is characterized by its numerous waterfalls and is famous for its tepui (table top mountains rising out of the flatlands), which are concentrated in the Gran Sabana and create an absolutely stunning setting at sunrise and sunset. The average temperature ranges from 40°F to 75°F depending on altitude and season. The dry season is from January to March. Waraira Repano is derived from an indigenous name for the area) protects part of the Cordillera de la Costa Central mountain range, in the coastal region of central-northern Venezuela. El Ávila National Park is located along the central section of the Cordillera de la Costa mountain system, in the Cordillera de la Costa Central mountain range. The area’s highest elevation is Pico Naiguatá, at 2,765 meters (9,072 ft) above sea level. This park has a high diversity of fauna and flora. More than 100 butterfly species, approximately 120 mammal species, 20 amphibians, 30 reptiles and 500 bird species (36% of Venezuela avifauna) have been documented. Nine bird species are endemic to Venezuela and three threatened bird species live in this park. In addition, more than 1,800 plant species from diverse taxonomic groups can be observed. Several of these plants are endemic to the Cordillera de la Costa mountain range with some endemic to the park itself. The vegetation is of mountain forest, with variations that is distributed according to the height. Between sea level and 200 or 300 meters (and even higher up in the orientation of relief) is the xeric forest, where prevail species like cují (Prosopis juliflora). Between 800–1500m ombrófilo sub-evergreen forest is characterized by 2-3 arboreal strata and relatively dense undergrowth is located. 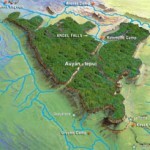 Among the 1,200 – 3 tree storeys and undergrowth well developed – 2,200 masl ombrófilo evergreen forest with 2 stands. In these forests abundant species of the families of orchids, ferns, bromeliads, aroids, and have reported endemic species of the family Sapindaceae, Melastomataceae, Rubiaceae and Myrtaceae and arborescent ferns and palms (Ceroxylon ceriferum). Presents anthropogenic savannas where predominate species like melao capim (Melinis minutiflora), the bambusillo (Arthrostylidium venezuelae), yellow tara (Oyedaea verbesinoides) and incense (Espeletia neriifolia). In the upper regions of the Silla of Caracas and the Pico Naiguatá is a characteristic vegetation of coastal bush subpáramo, consisting of open shrub of 1–3 m tall with a herbaceous relatively well developed, being the most characteristic species incense or frailejón tree (Libanothamnus nerufolius), Spanish flag (Castilleja fissifolia) and false frailejón (Liabum megacephalum). The National Park is named for the Cerro El Ávila (Mountain El Ávila), usually just referred to as “El Ávila”, which reaches 2,740 meters (8,990 ft) above sea level. This mountain rises north of the capital Caracas located in a narrow valley 950 meters (3,120 ft) above sea level and separates the city from the Caribbean Sea. The mountain is accessible by cable car (teleferico), by off-road vehicle, and on foot. In addition to the scenery, one may visit the hacienda, laboratory and mausoleum of Gottfried Knoche; a German-born doctor who was notorious for his experiments in mummification. They are accessible only by footpath. The archipelago of Los Roques is probably the best known of Venezuela’s Caribbean islands. Los Roques is an atoll of reef islands, tidal islets and reefs surrounding the Laguna Central. A massive variety of marine life exists in and around the reef habitats, and for this, the area was declared a national park in 1972. The archipelago is Venezuela’s largest marine park. The islands are edged with brilliant white sand, and at low tide, finger-like sandbars protrude into the turquoise sea. The main feature of the park is its large cave system itself. The cave was visited in 1799 by Alexander von Humboldt, who realised that the thousands of oilbirds (guácharos in Spanish; scientific name Steatornis caripensis) which live in the cave, belonged to a species unknown to science. Humboldt named the frugivorous, nocturnal species after the town of Caripe.The bird colony numbers around 18,000 and occupies the first chamber of the cave together with mice, crickets and crabs. Visitors are guided by lanterns down a concrete path that meanders alongside a stream and among vast piles of decomposing palm-seeds dropped by the guácharos. Visitors have access to the first sector of the cave; deeper exploration is possible but only with specialized equipment and permission from the park’s authorities. The Guácharo Cave National Park (Parque Nacional Cueva del Guácharo) is located 12 km from the town of Caripe, Monagas, Venezuela. The cave is a limestone cavern over 10 km long, with a number of large chambers and spectacular rock formations. The temperature inside the cave generally remains near 19 °C and the humidity at 100%. Oilbirds are fruit-eating birds that live within the first section of the cave; they leave at night in search of food. The Spanish name guácharo is onomatopoeic, and comes from an old Castilian word for one who shrieks or cries, because of their characteristic sound. They are brown with black and white spots, have a long tail and bristles around their beak. They measure around 48 cm in length, including the tail. The guácharos produce an organic layer in the cave called guano, formed by excrement and vomited seeds, which provide the basic nutrients for the cave’s ecosystem. The most important daily event in the park occurs in the evening, as dusk falls, when the birds exit the cave in great flocks, in search of food. Visitors are able to view the birds leaving the cave. The cave was designated as Venezuela’s first National Monument in 1949. The National Park was created in 1975 to conserve the cave and the forest eco-system where the oilbirds feed. The altitude of the national park is 900 – 2,340m. There are 367 species of bird in the national park, which has been designated an Important Bird Area. Although the oilbird is not an endangered species, several other resident birds fall into this category, for example the Venezuelan flowerpiercer (Diglossa venezuelensis) and the Venezuelan sylph. The national park is part of Cordillera de Caripe Alliance for Zero Extinction (AZE) site, along with another IBA the Zona Protectora Macizo Montañoso del Turimiquire. Near to the cave entrance is the Humboldt Museum. 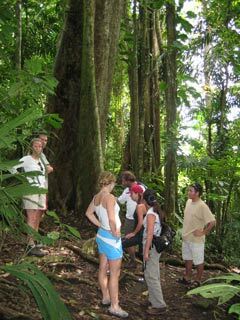 It offers information about the cave, the national park, the oilbird (guácharo), and Alexander Von Humboldt. Mochima National Park is located in the States of Anzoátegui and Sucre (state), on the northeastern coast of Venezuela. The park covers 94,935 hectares and is made up of an exclusively marine area in its western sector (Anzoátegui State), a coastal marine area that includes the Gulf of Santa Fé and Mochima Bay, and a mountainous area that covers the Turimiquire Dam watershed (Sucre State). Mochima Park was created to protect the montane forests of the Turimiquire Range and the country’s eastern Caribbean Sea marine landscapes, which are exceptionally beautiful. Day trips from the local hotels or Mochima include trips to beautiful islands with sandy beaches and clear turquoise waters, great for diving and snorkeling. Also dolphins are regularly spotted early in the mornings and early evening close to shore or during the day in the open sea close to the bays. The Sierra de La Culata is a mountain range in the largest massif in Venezuela, the Cordillera de Mérida, which in turn is part of the northern extent of the Cordillera de los Andes (Andes Mountains). The Sierra la Culata includes one of the highest peaks in Venezuela, like Pico Piedras Blancas, Pico Pan de Azúcar, Collado del Cóndor, between others. It is located between the states of Mérida and Trujillo. Most of the lagoons are a result from the Mérida glaciation. The Sierra La Culata National Park is a protected area within the range. The Sierra Nevada National Park is an important National Park of Venezuela located between Mérida and Barinas states in the west of the country. It was created on May 2, 1952, by decree of President Germán Suárez Flamerich, in order to protect the Sierra Nevada de Mérida in the Andes. It was the second national park decreed, after Henri Pittier National Park, which became the first Venezuelan national park 15 years earlier. The Sierra Nevada is an area of great ecological importance for Venezuela, for preservation of the ecosystem of the tallest in the country, where mountain ranges are located at higher altitudes of the Venezuelan Andes, including the Pico Bolívar, the highest geographical in Venezuela with 4,978 m.
The park encompasses parts of six municipalities of the states of Mérida and three of the Barinas state. Its total area is 276,446 hectares, of which 185,886 hectares belong to the state of Mérida, which means 67.2% of the total area, while the remaining 90,560 ha. represent the state of Barinas, 32.8% of the area of the park. The Sierra Nevada covers one of the two branches of the Cordillera de Mérida in the central Andes of Venezuela, which is the same name Sierra Nevada, the area of it is rugged highlighting the location of the main peaks in the country as these are Pico Bolívar (4,978 m), Pico Humboldt (4,942 m), Pico La Concha (4922), Pico Bonpland (4883), Pico Espejo (4880), Pico León (4740), Pico El Toro (4729) and Pico Mucuñuque (4609). The Sierra Nevada is separated from the Sierra La Culata, other Cordilleran massif of Andean mountain range, by depression of the Chama River in the north, while the northeast makes the valley of the River Santo Domingo, from the Kettle Mucubají to the dam José Antonio Páez. In the southwest, the boundary of the park forms the valley of River Nuestra Señora, left bank tributary of the Chama River, downstream from the city of Ejido. The park is in two major mountain ranges: the Sierra Nevada de Mérida and the Sierra de Santo Domingo, which are characterized by high peaks, glacial valleys and river valleys. Most rivers are the Chama, Albarregas and Mucujún flowing into Lake Maracaibo. Meanwhile, the Orinoco basin, the main ones are the Caparo, the Santo Domingo and the Cajurí that flows into the Uribante. In the park are also thirteen watersheds, and ten lakes of glacial origin, that global warming effects have been reduced, some of them are: Mucubají, La Negra, La Verde and Los Anteojos. The vegetation of the park is representative of the Andean cloud forests, mostly trees and undergrowth layers well developed and numerous epiphytes and endemic species. The higher altitudes, above 3,000 m is developed typical moorland vegetation, consisting of a large number of species of Espeletia. It also presents a xerophytic scrub vegetation in the drier areas of the River Basin Nuestra Señora. In Barinas, the vegetation is predominantly forest, with trees up to 25 m. height. 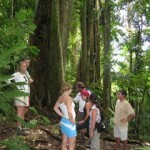 For more information about Venezuela’s national parks visit Think-Venezuela.net. As of the year 2002, Venezuela’s population is approximately 22 million. There are 31 indigenous tribes in Venezuela. Native tribes have been living in what is now known as Venezuela since 14,000 B.C. At the time of the land’s discovery by Christopher Columbus, it is estimated that over 500,000 native people lived there. Simón Bolivar, born in Caracas, led Venezuela to independence from Spain in 1821. Initially, Venezuela was part of one large state comprising Venezuela, Colombia and Ecuador. By 1830, however, three separate republics were created. Today, Venezuela is a constitutional democracy. In 2008 the currency underwent an overhaul – there were deemed too many zeros previously in their valuation – in fact the official currency was Bolivars and as many as 2,150 Bolivars were equal to $1 US. Now the currency is called Bolivar Fuerte and it is really difficult, even for the Venezuelans, to understand the currency since there exist many different rates (SIMADI / DIPRO / DICOM). The SIMADI rate as of writing / updating is the rate that is used for credit card purchases – such as hotels and food. It is not recommended to use ATM machines in Venezuela although in many major cities credit cards may be used if absolutely necessary. Since there exists a black market in currency many people exchange Euros or Dollars at differing rates higher than the official one! Venezuelan music combines Spanish, African and native rhythms. The native dance is called the joropo, which features vocals, guitars, maracas and harps. Along the coast there is a strong African influence. The locals dance the sensual tambora to powerful drum rhythms. Ancient art forms in Venezuela consisted mainly of rock carvings and cave paintings.